Explore the best of Cappadocia with this 2 Day/1 Night Cappadocia tour package from Istanbul including flights, transfers, day tours and accommodation in one of Cappadocia's famous cave hotels. You'll see all of the major sites including Goreme Open Air Museum, and you'll have a chance to explore Derinkuyu Underground City. It's an early start this morning, but totally worth it! You'll be picked up around 4.15am from your Istanbul hotel and transferred to the airport for your flight from Istanbul to Cappadocia (Kayseri). The flight duration is around 1 hour and 20 minutes. On arrival in Cappadocia, you will be met by one of our team and we will transfer you to Cappadocia so that you can meet your tour group. Today's Cappadocia sightseeing tour is a "Green" Tour. Your first stop of the day will be at Esentepe, a great play to enjoy Goreme's incredible panoramic view of the fairy chimneys and rock formations. We then head for Derinkuyu Underground City, one of the deepest of Cappadocia's underground cities. As you wander through it you will be impressed by the facilities which include stables, cellars, chapels and wineries. These were built by early Christians who lived in the area as a place to hide from invaders. We then continue on to Ihlara Valley. Here, you will have the chance to hike a section of the valley, checking out the tiny churches cut into the rock, along the way. We then take a break at Belisirma Village. Afterwards, we will visit Selime Monastery, the biggest rock-cut cathedral in Cappadocia. Our last stop of the day is Cappadocia's Pigeon Valley, named because of the thousands of Pigeon houses that have been carved into the soff tuff over thousands of years. 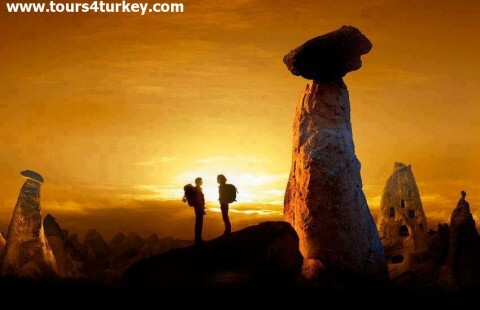 Afterwards we will drop you back to your Cappadocia cave hotel. Tonight, the evening is yours, free to soak up the atmosphere of this magical place. Alternatively, you may wish to take the opportunity to attend a Turkish night show where Turkey's rich history is showcased through a variety of folk dances. It's a memorable evening in a local cave restaurant and a great opportunity to learn more about Turkey's history in a relaxed setting. Tomorrow morning you have the opportunity to get another perspective of Cappadocia in a one hour Cappadocia Hot Air Balloon Flight at sunrise. Please let us know in advance if you want to take advantage of this great opportunity as places are limited. Your second day exploring magical Cappadocia starts at 09:30, when we'll pick you up from the hotel to take to continue exploring, covering what is often referred to as a Cappadocia "Red" Tour. Our first stop of the day will be at the UNESCO World Heritage-listed Goreme Open Air Museum which was once a Byzantine monastic settlement comprised of more than 10 churches, rectories, accommodation and a theological school. You’ll be amazed at the tiny churches carved into the rocks and decorated with frescoes, many of which are in good condition. Our second stop will be Paşabağ Valley, also called the Monk’s Valley, home to some of the best examples of mushroom-shaped fairy chimneys. This valley was previously home to a settlement of monks, and today you can climb up into one of the fairy chimneys and see part of their former quarters. We then drive to Devrent Valley , also known as “Imagination Valley”, where some of the most surreal rock formations can be found, many of them shaped like animals. See if you can spot the camel, snake, seal and dolphin-shaped rocks. You will have a chance to sample some tasty local Turkish cuisine at a restaurant in the town of Avanos, which is famous for its pottery. Afterwards, we will visit a local family-run pottery workshop for a kick-wheel pottery demonstration. Our last stop will be Uçhisar Castle, one of the highest points in Cappadocia. This is a great opportunity to get some great panorama shots of Cappadocia and the fairy chimneys. You tour will end at approximately 17:00. Afterwards, we will transfer you back to the airport for your flight to Istanbul at approximately 19:35. You’ll arrive in Istanbul at 21:15, where you will be met and transferred back to your hotel. Feel free to contact us through email in order to book the tour.